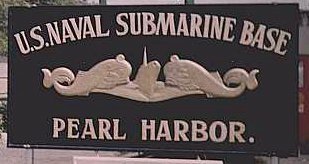 This website will present the activities at the US Navy Submarine Base at Pearl Harbor in the 1950's. As well as activities on the west coast of the US and in the western Pacific. Construction is in progress. Return often to watch the growth. I have a lot of pictures to scan. E-Mail me at with comments. This Submarine Ring site is owned by Grant C. Riddle. | Previous | Next | Check these related sites also.